Venous thromboembolism (VTE) is a term used to describe both deep vein thrombosis (DVT) and pulmonary embolism (PE) – disorders caused by thrombus formation. All patients being admitted to the hospital or undergoing surgery should be assessed for VTE risk on admission and re-assessed within 24 hours or if a change occurs in the clinical situation. VTE is one of the leading causes of preventable death in hospitals and is a important topic for juniors doctors to understand. 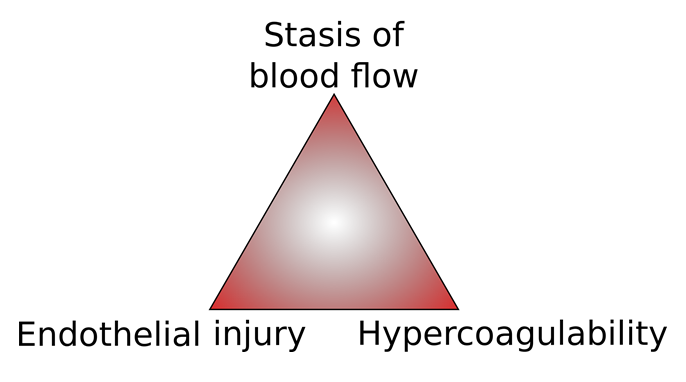 Figure 1 – Virchow’s triad; factors that can predispose an individual to thrombosis. A deep vein thrombosis refers to the formation of a blood clot in the deep veins of a limb, most commonly affecting those of the legs or pelvis. The most common presenting symptom of a DVT is unilateral leg pain and swelling. Other symptoms include low-grade pyrexia, pitting oedema, tenderness or prominent superficial veins. Importantly, 65% of DVTs are asymptomatic. 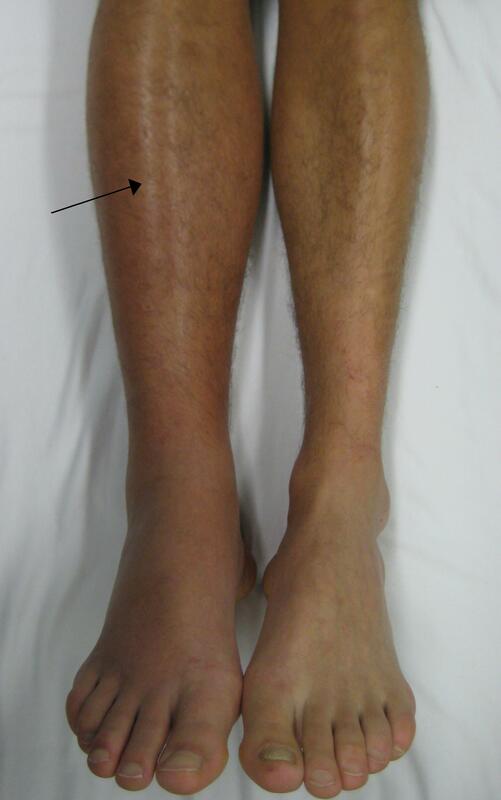 Figure 2 – Deep vein thrombosis in the right leg. The leg is swollen and red. *A D-dimer test is sensitive but not specific; a D-dimer may also be raised following recent surgery or trauma, with ongoing infection or inflammation, concurrent liver disease, or pregnancy, and indeed in any patient with a prolonged hospital stay. Direct oral anticoagulants* (DOACs) are now recommended as as first line treatment for DVT. Caution is advised in those with chronic renal impairment or if taking potentially interacting medications. Some individuals with DVT may warrant Vitamin K antagonists instead, most commonly is Warfarin, which require therapeutic LMWH to cover until the INR levels are sufficnetly therapeutic. LMWH alone is recommended in patients with cancer-associated VTE, due to lower recurrence rates than on Warfarin. A pulmonary embolism (PE) refers to a blockage of the pulmonary artery by a substance that has travelled there in the bloodstream. Most commonly, this blockage is a thrombosis that has broken off and migrated (such as from a DVT). Other causes include a right-sided mural thrombus (e.g. post-MI), atrial fibrillation (AF), neoplastic cells, or from fat cells (e.g. following tibial fracture). 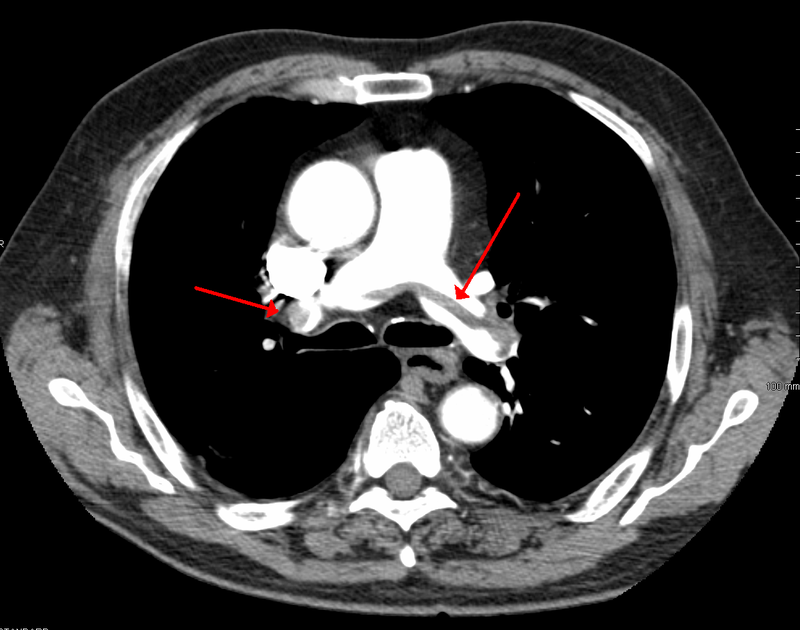 The key clinical features of a PE are sudden onset dyspnoea, pleuritic chest pain, cough, or (rarely) haemoptysis. Clinically, a patient may have tachycardia, tachypnoea, pyrexia, a raised JVP (rare), or pleural rub or pleural effusion (rare). Remember to examine for any signs of DVT in any patient with suspected PE. Score greater than 4 – PE clinically likely and a PE diagnosis should be confirmed with a CT Pulmonary Angiography (CTPA) scan (or V/Q scan in those with poor renal function). An ECG should be performed due to the differential diagnosis of MI, however this most commonly shows no abnormalities or a sinus tachycardia*. For haemodynamically stable PEs, management is much the same as for DVTs, as discussed above. For those with suspected PEs causing haemodynamic compromise, thrombolysis may be warranted however will require input from medical and intensive care teams. Recurrent PEs known secondary to recurrent DVTs, despite pharmacological management, should be considered for IVC filter. An important part of the management of VTE is prophylaxis. Prophylaxis is typically continued until the patient is no longer considered to be at significant risk of VTE. All patients undergoing surgery should be offered mechanical prophylaxis unless otherwise contraindicated; mechanical prophylaxis (antiembolic stockings) should not be used in patients with peripheral arterial disease, peripheral oedema, or local skin conditions. Which of the following contributes to 'abnormal blood components' of Virchow's triad? Which of these in NOT a risk factor for a VTE? Which of the following is the most common presenting feature of a DVT? Which medications are most commonly used in the treatment of DVT? What does a PE Well's score >4 indicate? Which of these is NOT a contraindication to mechanical thromboprophylaxis?